The Santa box is found at the Silhouette Store #35894. 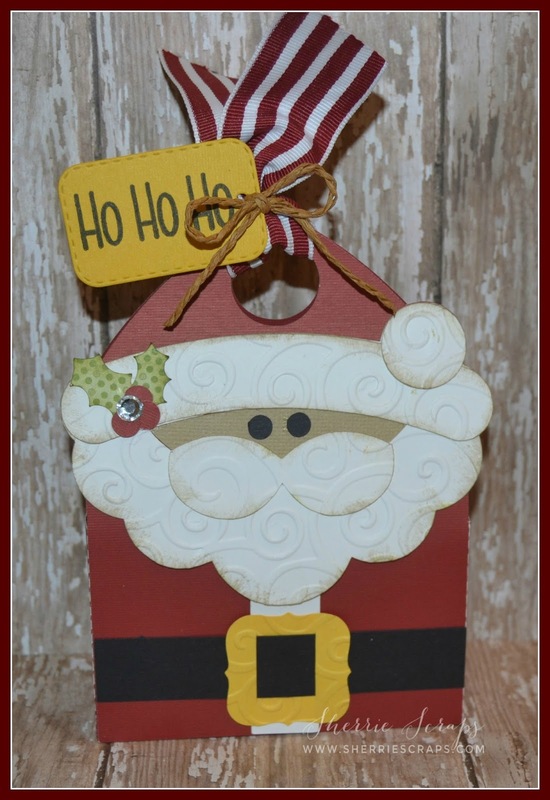 I cut all the pieces and embossed the Santa's beard, hat and belt buckle with the divine swirls folder. I finished with tying on ribbon and jute from my stash and adding a cute tag. 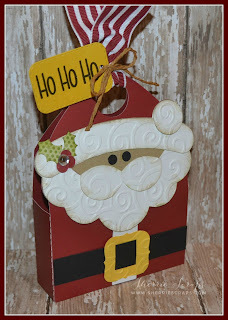 I stamped the sentiment with Christmas Signs onto a Mini Tag Dies 2 from Jaded Blossom. Oh, this could not be sweeter, Sherrie!! Santa looks adorable!! I love his swirly beard and 'stache!! You decorated him perfectly!! I love the red and white ribbon!! What a fabulous project his is!! I need to fire up my Explore and scrap-lift this!! Like the wonderful Santa bag. Especially like how the embossing looks. Thank you for entering DLART Christmas challenge. What a fabulous Santa box!! Love the embossing and pretty ribbon!!! Have a great day. Such a darling Santa! I love the embossing and your inking looks wonderful. He is too CUTE! I love this Santa! I made a few last year and everyone loved them. Oh Sherrie, this treat bag is just too cute and love the embossing!! Sherrie ~ Oh goodness this is just ADORABLE!! Seriously ~ the embossing, the details and oh my that ribbon! I just love your adorable Santa box with Santa's swirly embossed beard, hat trim, and pom-pom! This is darling Sherrie! I love his embossed neared! Such a cute cute treat! This is ADORABLE!!!!!!! I love it!!!!!!!!!!!!!!!!!!!!!!!!!!!!!!!! This is so cute Sherrie! Your Santa box is so adorable! Love how you embossed the beard! Very pretty ribbon and the "ho ho ho" tag is perfect! Happy December my friend!!!! I can not believe how fast this year went by! Hope you are having a great holiday season! Off to check out what else I have missed here! This is so cute, love Santa's face so happy and makes you just keep smiling.Thanks for playing along over at DL.ART! 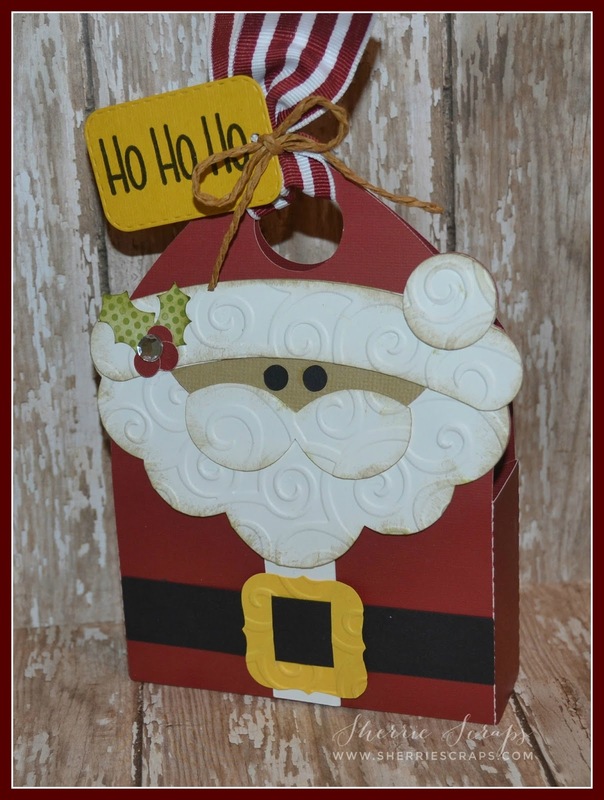 Sherrie this treat box is adorable and perfect for Christmas ! Great details ! What a cute Santa bag. Love the embossing on his beard. This is too cute! I love paper boxes like this. Awesome job. How cute and lovely! This is a fantastic project! Thanks for playing with us at Craftin Desert Divas Linky Party! This Santa is absolutely ADORABLE!! Love the fun JB stamp! Oh my gosh Sherrie! I wish you could see me, I am having a fit over this cute Santa! I love the way you embossed the beard! Ack! This is darling! Totally love it from head to toe. Thanks for joining the DoubleClick Skittles Challenge. This would make a great gift for my students too. Need to try and get busy to make them something before Winter Break! Oh how fun Sherrie! Love Santa's embossed beard! What a great little treat holder! Love the texture on the beard! Thank you for joining us at Decorate to Celebrate! Me again! This Santa treat is just too cute to not see twice! Thank you for joining our “Christmas” Challenge this week at DoubleClick Skittles. Oh my goodness...just love your sweet Santa treat, so much fun! Thanks for joining us at DoubleClick Skittles. Super adorable treat bags Sherrie.....love the embossed beard! Oh Sherrie this is so adorable. i hope you are well and ready for the Holidays:) Thank you for joining us at Decorate to Celebrate.